Gresley is most famous for his LNER Pacifics. Although they reached their peak with the streamlined A4s, this famous line of 'racehorses' began with the A1 Pacifics. The first two A1 Pacifics were built in the twilight years of the Great Northern Railway (GNR) and entered service in 1922. The A3 was a modification of the original A1 design, and all of the surviving A1s were eventually rebuilt as A3s. Thompson designated the remaining members of the A1 class awaiting rebuilding as the A10 Class. Almost as soon as Gresley was appointed the CME of the GNR, he started to think about large express passenger locomotives. His predecessor, Ivatt, had already experimented with compound 4-cylinder Atlantics (LNER C1) with high pressure boilers and wide grate areas. Gresley's first designs followed these ideas, and an old Atlantic was suitably modified in 1915. This was followed by plans for two different Pacific designs, one of which was merely a modification of his Atlantic design. At about this time, Gresley became interested in 3-cylinder designs, and was diverted into designing his famous conjugated valve gear. This operated the valve for the middle cylinder, from the motion of the other two cylinders. This was patented in November 1915, although Gresley readily admitted that the principle was based on a lapsed patent of Holcroft's. Due to the War, the express passenger designs had been shelved, but Gresley tested the new valve gear with a 3-cylinder 2-8-0 (LNER O2) which was completed in 1918. This was followed by a much-needed express goods 2-6-0 engine (LNER K3) which used a simpler version of the conjugated gear. 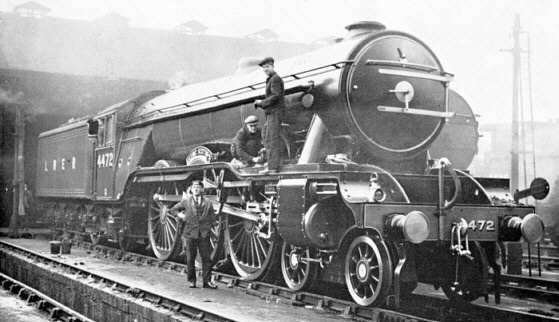 Finally in 1920, Gresley was able to return to his plans for an express passenger Pacific, which by now included his conjugated valve gear.The K3s exhibited valve over-run at high speeds, so the maximum travel was reduced. Unfortunately, this reduced the locomotive's performance. The boiler design was inspired by the Pennsylvania Railroad's K4 Pacific design. The boiler was reduced to the GNR loading gauge, but still kept a tapered shape and tubes less than 19ft long. In April 1922, No. 1470 Great Northern became the first A1 to enter service. No. 1471 entered service in July 1922 along with an order for a second batch of nine engines. From the beginning, Gresley claimed the A1s were designed to pull 600 ton trains, and in September 1922 No. 1471 pulled just such a test train, confirming the abilities of this new class. Raven had developed a Pacific (LNER A2) for the North Eastern Railway (NER) at the same time. So in 1923, the newly-formed LNER conducted a series of tests comparing these two new designs. The Raven A2 No. 2400 had no problem in producing enough steam, but A1 No. 1472's boiler pressure varied during the tests. No. 1472 consumed notably less coal and water, and the A1 was considered the better design which could be more readily improved in the future. Hence the A1 design was chosen over the A2. These original 11 engines were built to the generous GNR loading gauge, and had to be amended to fit the loading gauge of the LNER. The chimney and dome had to be both reduced in height, and shorter safety valves were fitted. Later engines were all built to the LNER loading gauge. The A1s quickly showed their ability to haul heavy loads on the East Coast Main Line, but proved inefficient with coal and water. These inefficiencies showed up in the 1925 Great Western Exchange Trials. Although much has been debated about these trials, the relatively mature Castle design (based on the 19 year old 'Star') did prove to be more efficient than the relatively new A1 design (3 years). Indeed, during the 1920s the A1s experienced a series of small low-cost improvements which produced significant improvements in efficiency. In 1924, The Superheater Co. in New York, created plans for a new superheater design (Type E) which should have improved the steaming abilities of the A1s. After a series of tests, the improvements were found to be small and uneconomic. This surprisingly low improvement was explained by the fact that the original A1 superheaters used the standard Robinson design which concentrated the superheater tubes where they would be most effective. Hence the extra tube surface area in the new superheater, had to be in less effective areas of the boiler. In 1925, No. 4477 Gay Crusader had its steam lap setting increased 3/8in to 1 5/8in. This was followed in 1927 by No. 2555 Centenary also having its valve travel set to 5.75in in full gear. No. 2555 entered trials which showed a reduction in coal consumption from 50lb/mile to 39lb/mile. This huge improvement led to the change being adopted on all of the A1s by 1931. In 1926, all of the piston valve rings were replaced on the A1s. The original rings were sprung to ensure a steam-tight fit. This resulted in large losses due to frictional heating. It also inhibited lubrication. The valves were replaced with Knorr type piston valves. These were made steam-tight with four packing rings, so greatly reducing the contact area between the walls and the piston. Hence, frictional heating losses were greatly reduced. Between 1927 and 1947, all of the A1s were rebuilt as A3s, with the exception of No. 4470 Great Northern, which was rebuilt by Thompson in 1945 as Class A1/1. In 1945, Thompson redesignated the remaining A1s as Class A10. 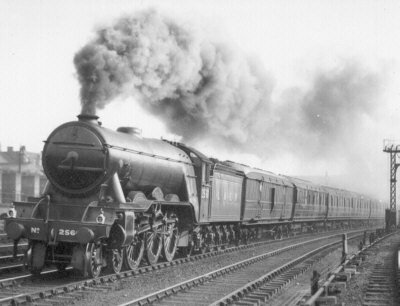 After the Type "E" superheater failed to produce any significant results, Gresley decided to increase the number of flues in the Robinson superheater which was already in use in the A1s. At the same time, it was also decided to increase the boiler pressure from 180psi to 220psi. The first five of these new boilers were ordered in 1927. By the end of 1927 No. 2544 Lemberg and No. 4480 Enterprise had been rebuilt with the new boilers. Locomotives with the boiler rebuild were given the designation of Class A3. These were followed by three more rebuilds in 1928. The cylinder size was kept the same (20in), except for No. 2544 which had lined 18.25in cylinders so that the tractive effort would be similar to the A1s. This allowed comparative trials to be made. The trials were a success, and 27 new A3s were built between 1928 and 1935. These locomotives had slightly smaller cylinders of 19in, and the original five rebuilds were fitted with this new size. Due to the wider header on the A3 boilers, the ends projected slightly through the sides of the smokebox. Hence, cover plates were fitted to cover up these projections. These cover plates are the main external distinguishing feature between the A3s and the A1s. With the advent of the A3s, all new Pacifics were built to the A3 specification rather than the A1. Also, no new 180psi A1 boilers were built. Further rebuilding of the A1s was generally when the boilers expired. The last A1 was rebuilt in 1947 - a testament to the longevity of many of the original A1 boilers. The only A1 not be rebuilt as an A3 was No. 4470 Great Northern, which was rebuilt by Thompson in 1945 as Class A1/1. A3s built from new were were fitted with left-hand drive. This contrasts with the right-hand drive of the A1s which was also kept when they were rebuilt as A3s. These would not be converted to left-hand drive until after 1951. With the arrival of the A4, it would have made sense for the A1s and A3s to be rebuilt with a non-streamlined form of the even higher pressured A4 boilers. However these would have been more expensive, and in the run up to World War 2, the LNER was attempting to save money. A4 boilers would eventually be fitted during the British Rail era. In 1943, Thompson considered fitting V2 boilers. These were being produced in large quantities at the time, and the shorter boiler would have implied a longer smokebox - an arrangement Thompson tended to favour. This scheme did not go ahead. The first fitting of the Kylchap double blastpipe arrangement was in 1937 to No. 2751 Humorist. Humorist had been used extensively in a series of unsuccessful smoke-lifting experiments during 1932-3. This time, the double blastpipe was fitted with a lipped double chimney, but no smoke deflectors. The softer blast from the Kylchap arrangement required the use of smoke deflectors. Small wing deflectors on either side of the chimney were fitted in January 1938. These deflectors were on the small size, but the results could be accepted. They were eventually replaced with the larger deflectors used on the new Peppercorn A2s, in 1947. All 79 of the A1s and A3s survived into British Rail ownership. This excludes No. 4470 Great Northern which was rebuilt by Thompson in 1945 as Class A1/1. A3 development continued after Nationalisation in 1948. The remaining right-hand drive A3s were finally converted to left-hand drive between 1952 and 1954. From 1954, A4 boilers were fitted to some of the A3s. This was not to improve performance, but because A3 spares were in short supplies. Only about half of the A3s were rebuilt with A4 boilers. These boilers were in an un-streamlined form, and had their pressures reduced to 220psi. Kylchap blastpipe/chimneys were fitted between 1958 and 1959 to all of the remaining A3s. The soft blast remained a problem, but this time it was solved using "German-style" smoke deflectors. No. 60097 Humorist retained its large smoke deflectors that were fitted in 1947. These small improvements to the A3s worked well, but the BR Modernisation Programme was well advanced. The first A3 was withdrawn in 1959, and the Deltics replaced the A3s on the East Coast Main Line in 1961. The A3s moved to other duties, most notably the expresses to Scotland on the Midland Route out of Leeds. The last A3 to be withdrawn No. 60052 Prince Palatine, was withdrawn in January 1966. All were scrapped except for No. 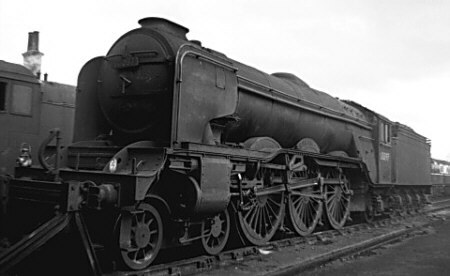 4472, Flying Scotsman which was withdrawn in January 1963 and sold into preservation. The following tender details are for the LNER non-corridor tenders. Heating Surface: Total: 3455 sq.ft. 3981 sq.ft. Firebox: 215 sq.ft. 215 sq.ft. Superheater: 525 sq.ft. 1104 sq.ft. Tubes: 1880 sq.ft. 503.6 sq.ft. Flues: 835 sq.ft. 2158.8 sq.ft. Grate Area: 41.25 sq.ft. 41.25 sq.ft. Sadly, No. 4472 Flying Scotsman is the only A3 which survived into preservation. After a colourful preservation history, it is now owned by the National Collection. Flying Scotsman has had a colourful life in preservation. When withdrawn in 1963, it was purchased by Alan Pegler who removed the German-style smoke deflectors and fitted a corridor tender. A lined LNER Doncaster green livery was chosen. After 20 months of charter trains, it entered Doncaster for a change of boiler and overhaul. This time it was repainted in a traditional Darlington Green livery with black and white lining. With the demise of BR steam, water supplies were hard to get, and so in 1966 Alan Pegler added the Flying Scotsman's famous second tender. This tender was a corridor type, which was adapted to store 6000 gallons of water. By the time of the next overhaul in 1968, it had to be overhauled by Hunslet (Leeds), because Doncaster was no longer able to overhaul steam locomotives. In 1969 it was fitted with a warning bell, cowcatcher, and buckeye couplings before travelling to the US and Canada. At the end of this tour it ran a slow (10mph) shuttle service along a dock line in San Francisco. It then moved to a camp just outside of San Francisco for much of 1972. With a very uncertain future, No. 4472 Flying Scotsman was then saved by W.H. McAlpine who brought it back to the UK in February 1973. In the past 30 years, No. 4472 Flying Scotsman has been owned by a number of people including Pete Waterman and Dr. Tony Marchington. Throughout this time it has continued to run charter services and visit preserved lines. It has also appeared in a number of liveries, including a controversial black livery. In 1988, No. 4472 Flying Scotsman ventured abroad a second time, this time to Australia for the Bicentenary celebrations. During this visit, it set a new record for the longest non-stop run for a steam locomotive. The previous record was set in 1948 by the sister A4 Pacifics when flooding caused the non-stop services from London to Edinburgh to be diverted over the Waverley route. After Dr Tony Marchington purchased Flying Scotsman it was given a major restoration returning it to running condition in the late 1990s. It was then operated commercially by Flying Scotsman Railways in an attempt to cover the costs of the rebuild and future maintenance work. This does not appear to have been successful, and in early 2004 Flying Scotsman Railways decided to sell No. 4472. After a competitive bidding process ending in April 2004, it was announced that the National Railway Museum would be the new owner. Using money raised from the general public, matched by Richard Branson, and a substantial grant from the National Heritage Memorial Fund, the National Railway Museum believes it has enough money to keep No. 4472 Flying Scotsman running for a long time to come. Plans also include a display area in York where visitors will be able to see No. 4472 when it is not out on the main line. Finally, the last surviving A3 is where it belongs: in the National Collection! Flying Scotsman is currently fitted with an A4 boiler. A spare A3 boiler, formerly fitted to Salmon Trout and Humorist also survives in the National Collection. This was fitted to Flying Scotsman during the 1970s, and it has been recently announced that it is to be overhauled using original construction methods and materials. Graham Farish sold ready-to-run models of N Gauge A3s in various forms (eg. with and without smoke deflectors). These have been re-introduced by Bachmann. Minitrix also sold an N Gauge The Flying Scotsman. This had a reputation for running well but was based on a continental chassis which could have been more realistic. Hornby sell a ready-to-run OO gauge (4mm scale) model of the Flying Scotsman, and have recently introduced a model of the Flying Scotsman to their live steam OO gauge range. Proscale, DJH, and SE Finecast all produce 4mm scale kits of the A1/A3. DJH sell all variants but only as limited runs. The SE FineCast model is sold with the GNR or non-corridor tender, but corridor tender conversion parts are available. Jamieson have produced an A3 kit for 4mm, but current availability is unknown. Martin Finney sells etched kits of the A3 for both the 4mm and 7mm scales. David Andrews Locomotive Kits produce kits of the A1 and A3 with the original GNR tender or the LNER non-corridor tender. Ace Trains, Bachmann, Bassett-Lowke, Sunset Models, and Fitzroy Loco Works (Australia) have all sold ready-to-run models of either the A1 or A3 in O gauge (7mm or coarse scale). Kits are also available from DJH, ACE Products, and David Andrews. Aster Hobbies sell a live steam A3 for Gauge 1, complete with Gresley's conjugated valve gear. Accucraft UK, Ltd produce an electric A3 for Gauge 1 with a fully painted all metal construction. Most of the A1s and A3s were named after racehorses. The A1 and A3 Racehorses page lists these locomotives with the racehorses they were named after, and the races they won. No. 2553 Manna was renamed Prince of Wales in 1926, and No. 2563 William Whitelaw was renamed Tagalie in 1941. No. 4470 Great Northern was rebuilt as an A1/1 in 1945 rather than as an A3. No. 4472 Flying Scotsman was sold into private ownership. Thank you to Dennis Butler for the photograph of the unidentified A1 at speed, and A3 No. 2508 Brown Jack. Thank you to David Hey's Collection for the Former BR Publicity Manager, N. Johnson's photograph of No. 2751 Humorist with small 'wing' smoke deflectors. Thank you to the Mike Morant Collection for the photograph of BR No. 60097 Humorist with large smoke deflectors. Thank you to the P.H. Groom collection for permission to use the above photograph of BR No. 60066 Merry Hampton with smoke deflectors.